During his tenure as UCLA chancellor, Albert Carnesale laid the foundation for a legacy of institutional transformation in the areas of research, teaching, community service and residential life. He and his wife, Robin, were on campus on Oct. 16 for a dedication ceremony to officially mark the naming of one of UCLA’s newest buildings as Robin and Albert Carnesale Commons. "This is obviously a brand-new facility, and it’s a beautiful facility and a much needed addition to The Hill, but we need to place this facility into context," Chancellor Gene Block told more than 50 guests, including Chancellor Emeritus Charles E. Young, who served from 1968 to 1997. "In fact, the transformation of UCLA from a commuter school to a residential campus really got started during the Carnesale administration. And much of what Al did during the late 1990s and early 2000s laid the foundation for the transformed UCLA campus that we see today." Today, more than 94 percent of freshmen and nearly 40 percent of the total undergraduate student population resides on campus. This fall, a record 11,000 students moved into on-campus housing. As chancellor from 1997 to 2006, Carnesale also completed a $3.1 billion fundraising campaign, which at the time was the most ambitious in the history of higher education, and launched the Fiat Lux freshman seminars, the California NanoSystems Institute (CNSI), the Broad Stem Cell Research Institute, the Nazarian Center for Israel Studies and the Institute for Society and Genetics. His leadership also resulted in a doubling of research funding from competitively awarded grants and contracts. More than 100 partnerships with community organizations were forged through the "UCLA in LA" initiative. In addition, major additions to UCLA’s physical landscape were also realized, including the Ronald Reagan UCLA Medical Center, UCLA Santa Monica Medical Center, Broad Arts Center, new buildings for health sciences, physics, engineering, and the California NanoSystems Institute. 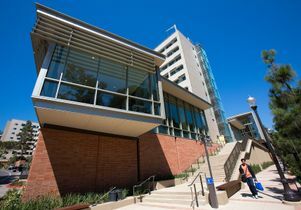 Renovations to historic UCLA buildings, including Glorya Kaufman Hall, Haines Hall, and the Humanities Building, were also completed during his time as chancellor. 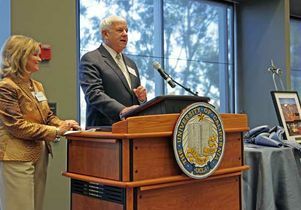 "My UCLA mantra from the very beginning was 'concentrate on excellence,'" said Carnesale, UCLA chancellor emeritus and a member of the National Academy of Engineering and of the Council on Foreign Relations, and a fellow of the American Academy of Arts and Sciences and of the American Association for the Advancement of Science. "These initiatives were hardly mine alone. They build on the work of UCLA leaders who preceded me, especially Chuck Young, and enhanced by the leadership of my successors, Norm Abrams and Gene Block." Carnesale is currently a professor of public policy and of mechanical and aerospace engineering at UCLA. His teaching, research, and service focus on public policy issues having substantial scientific and technological dimensions, such as those arising in international affairs and national security strategy. Carnesale has become increasingly involved in leading top-level committees within the National Academies — the umbrella organization that includes the National Academy of Sciences, National Academy of Engineering, Institute of Medicine and National Research Council —on investigating questions of national interest. Among the issues he has studied at the request of Congress are whether to replace the nuclear warheads on some of America’s long-range missiles with non-nuclear weapons and what should be America’s response to global climate change. He has also served on President Obama’s Blue Ribbon Commission on America’s Nuclear Future. Robin Carnesale is an active participant in university life, serving on the advisory boards of the UCLA Institute for Society and Genetics and the Nazarian Center for Israel Studies, and has served on the UCLA boards of Friends of Jazz, Women and Philanthropy, and Royce Center Circle. She is also founder of RGA, Inc., a legal communications and crisis management consulting firm based in Los Angeles. In addition, she has served on a variety of non-profit boards, including Channel 36, The Disability Rights Advocates, the Anti-Defamation League and Variety Club Children’s Charities. She directed the Mayor’s Corporate Challenge for Youth and was a founder of the Catholic-Jewish Women’s Conference and the Women’s Campaign for Soviet Jewry. Robin and Albert Carnesale Commons, located just south of Covel Commons on The Hill, houses Bruin Plate, which is among the first health-themed dining halls in the country and the first west of the Mississippi; and the Palisades Room, a 6,700 square-foot multipurpose space complete with surround sound and state-of-the-art video screens. Above the dining hall is the Living Room, a casual 2,700 square-foot meeting space that opens to an outdoor patio with views of campus. In addition, a fitness room on the building's ground level is expected to open during the 2014–15 academic year. Bruin Plate dining hall with Sproul Landing on the right and Sproul Cove on left. Albert and Robin Carnesale honored by naming of new commons at UCLA. 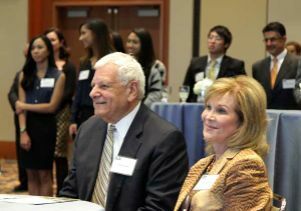 Albert and Robin Carnesale were honored with the naming of a new commons at UCLA.